The Rottweil Study Centre was opened in March 2016. It is located on the site of the former Gunpowder Factory in Rottweil, where as far back as the 30-Year War, gunpowder mills were located. 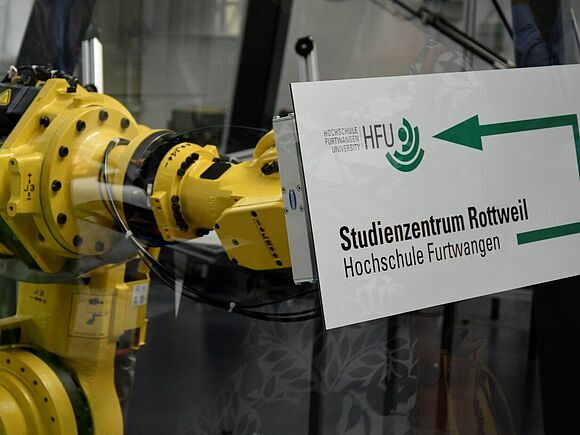 It houses the innovative plasma coating technology of the Faculty of Mechanical and Medical Engineering as well as a hall for mechanical engineering and Industry 4.0 with high-tech robots, automation technology and simulation. Besides University research, some of which is international in the field of coatings for medical technology, practicals for students in the Micromedicine, Advanced Precision Engineering and Technical Physician master's programmes are also held here. In addition to practicals, the plant and equipment of the Study Centre can also be used by students in the bachelor's study programmes for coursework, project practicals and bachelor's theses. Students in master's programmes are regularly offered research practicals on highly interesting topics, and can also carry out thesis work on coating technology and mechanical engineering and robotics. We cooperate closely with the Rottweil high schools offering practicals for high school pupils in which the theoretical content of their courses in the natural sciences and technology is expanded with real-life examples from R&D.